Mrs Bradshaw is perhaps the most tried and tested variety of Geum. It produces masses of hot red blossom and would work well at the front of sunny red themed or hot border. Consider planting with other sun loving Mediterranean plants. 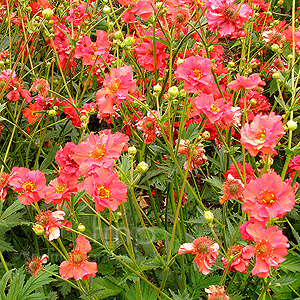 Cultivation tips: Geum will flourish on most moist garden soils, yet they don’t like wet or heavy clay soils. Geum prefers planting in full sun towards the front of the border where they can grow without being smothered by taller plants. Prop by dividing in autumn or spring.